We want to keep you informed. That’s why we’ve made it easy for you to choose which alerts we send you and how. Select your desired communication channel of voice, text or email. Option to add additional contacts—great for family members or roommates. Select your preferred time window to receive alerts. Electrical Outage: Receive status updates for power outages. Water Issue: Receive status updates for reported water problems. 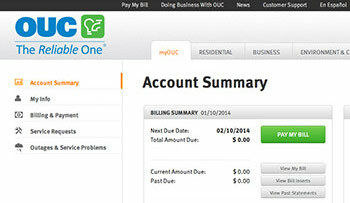 Statement Ready: Receive notifications when your billing statement is available to be viewed on myOUC. The notification includes the total amount due and any past due or credit balance. AutoPay customers will receive a notification that their statement is ready to be reviewed and the amount and date of the scheduled bank draft. Payment Reminder: Receive notifications when your payment is due, not paid five days from the due date, and two days past due. AutoPay customers will also receive a reminder the day before scheduled fund withdrawal. Payment Status: Receive notifications that a payment was received or if there is a problem receiving the payment. Get started by texting REG to 69682 (myOUC) on your mobile device or register by setting your preferences using the Log In button below. Once logged in, click Alerts on the left navigation and then click Manage Preferences. Visit the Alerts User Guide or go to our 'Frequently Asked Questions' section and click on 'Alerts' on the right hand navigation.